Victrex joining the TPRC as a tier-1 member demonstrates the company´s dedication to driving the adoption of new technologies that will open additional opportunities for the aerospace industry. The ThermoPlastic composites Research Center (TPRC), Enschede/The Netherlands, has a new tier-1 member: Victrex, an innovative world leader in high-performance polymer solutions, who recently introduced the new VICTREX AE™250 composite family based on polyaryletherketone* (PAEK) polymer. Planned joint activities will concentrate on the acceleration and proliferation of new technologies with the aim of addressing industry needs regarding costs, speed of manufacturing and assembly of aircraft components. TPRC has an extensive thermoplastic (TP) processing knowledge, Victrex has in-depth expertise in PAEK materials and applications in combination with a new hybrid molding technology. As a tier-1 member, Victrex will work alongside other tier-1 and 2 members, such as Boeing, Daher, Dedienne Aerospace, TenCate and Vaupell | SB aero. With the design and manufacture of an advanced demonstration part, the TPRC earlier this year presented the results of a collaborative project of its members and further renowned companies** on the overmolding of thermoplastic composites. The part features a typical grid stiffened panel that can be found in large numbers in aerostructure applications, made of VICTREX™ PAEK material solutions and currently among the finalists for the prestigious CAMX Combined Strength Award 2017. The winners will be announced during the CAMX, the Composites and Advanced Materials Expo in Orlando, Florida, USA (September 11-14, 2017). 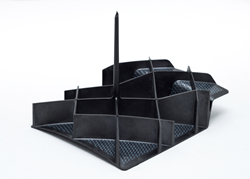 VICTREX AE™250 composites in combination with a new hybrid molding process have been developed by Victrex and identified as a promising option to potentially speed up manufacturing of aircraft component and aircraft assembly. However, in addition to building a supply chain to deliver commercial quantities, supplementary research and intensive testing is still needed and to this end, a key focus of the TPRC project will be determining the characteristics of the hybrid molded interface, including the mechanical performance. 1 Polyaryletherketone (PAEK) is a family of high-performance thermoplastics, with Polyetheretherketones (PEEK) representing over 80% of materials in the PAEK family.